A Silent Voice has been widely praised, and it certainly deserves its positive reviews. We almost never got to experience A Silent Voice. 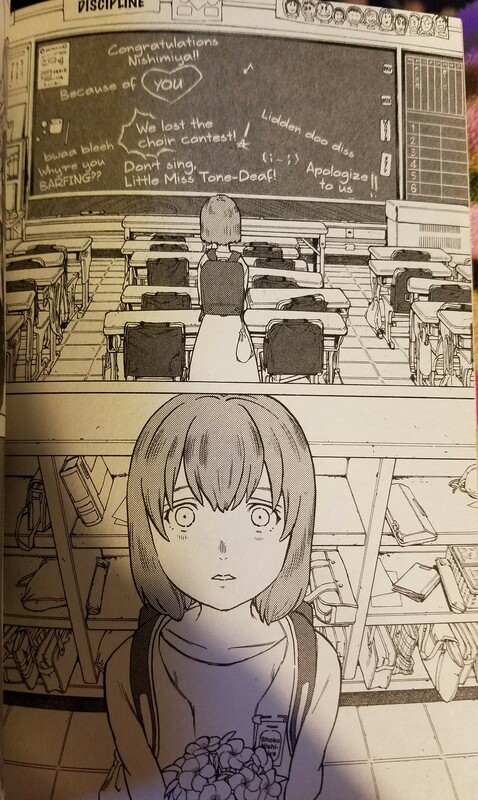 Oima submitted a one-shot about a deaf girl being bullied that took the first place prize, but the content caused months of debates and internal struggling for the publisher. Well, long story short, Oima relaunched A Silent Voice in Weekly Shonen Magazine, the same magazine that houses series like Fairy Tail, UQ Holder!, and The Seven Deadly Sins. Yes, A Silent Voice is hardly usual shounen fair. There are no battles outside of a few schoolyard fights, fanservice is little-to-nonexistent, exploring is limited to getting on a train to head to the next town, and no one is a legendary anything. So how is A Silent Voice a shounen manga? Well, the lead, Shoya, is a former so-called bad kid. Okay, sounds pretty common. Several male leads are delinquents (Yu Yu Hakusho, GTO). But how many of these protagonists harassed a classmate? Bullied someone who has a disability? Yeah, not many. So is A Silent Voice a manga about bullying? Sort of. This series is kind of hard to describe. Despite as much attention there is on bullying, I wouldn’t call it the center of the story. Most of the cruelty occurs in the first volume as an extended flashback. So, if the effects of bullying is not the theme, what is? Making amends? Learning to like yourself? Learning to like others? Friendship? Romance? The answer to all: sort of. We first meet Shoya in high school seeking out Shoko. Then we see how they knew each other back in elementary school. Well, “knew” may be an inaccurate term; Shoya constantly harassed Shoko. He stole her hearing aids, made fun of her speech, and just plain treated her badly. While he admits he was the main perpetrator, most of the class either joins in or doesn’t discourage Shoya’s behavior. There’s a cult mentality, but, as often the case in such situations, his “friends” turn on him when they need a scapegoat. Shoya quickly narrates over the next few years as the story turns back to the pair in high school. He wants to apologize to Shoko, but how does someone who has turned away from — and been turned away — show another the bright spots in life? To show the magic of friendship? And this is why it’s so hard to describe this series. A Silent Voice isn’t just about making amends, as Shoya has already done some significant maturing off-screen by taking it upon himself to learn sign language. Liking yourself also seems to be a key theme, but when the two leads spend more time focused on making the other happy, it falls by the wayside. Even the idea of listening to someone’s inner voice isn’t fully realized, as the manga ends without Shoko revealing her true feelings to Shoya. While too many plotlines tend to spoil manga, all these themes make a strange combination that mostly works. I say “mostly” because I feel the first half is much stronger than the second. The manga is just plain better without a bunch of additional classmates. Shoya is eventually roped into making a movie with his new (self-proclaimed) best friend, and I just feel like the story worked better with a smaller cast. Shoko eventually decides on her future, but we don’t really see Shoko interested in her chosen career until her sister mentions it. When a dramatic incident occurs in the sixth volume, we slug through a chapter for each of their friends. I don’t really care about a girl who tries to act kind and cute for the boy she has her eye on. I can understand widening Shoya and Shoko’s social circles a bit, but all these “friendships” just felt forced. If anything, I would have rather brought in characters like Shoko’s absent father to add drama in the series. In Oima’s defense, showing some fellow classmates allows Oima to explore the different aftereffects bullying can take. 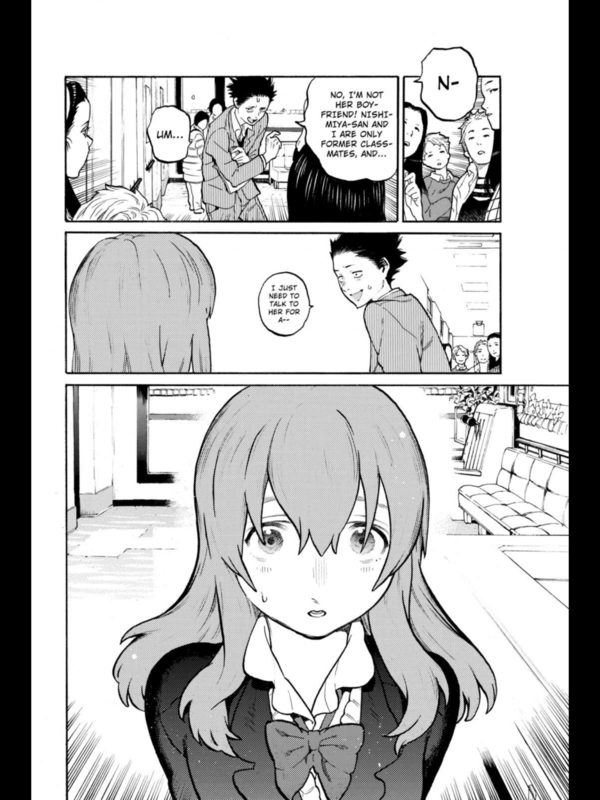 A Silent Voice is a very psychological manga, showing off the results of group mentality right from the start. Shoya blocks out others, and this is shown visually by people with Xs over their face. His attempts to make things right are wonderful, but his self-hatred is not exactly mentally healthy. It’s just addicting to get into the mind of some who is both a bully and the bullied, the struggle he has between what he wants to do and what he can actually do. This internal conflict is where A Silent Voice shines brightest. This is especially true because we learn Shoya is not the only person with issues. Shoko herself is a mystery in many cases, as the manga is mostly from Shoya’s point-of-view. When readers start putting the pieces together, we see a fragile girl who tries to smile the pain away. Shoko’s sister seems to have a creepy obsession, but her motivation is extremely moving. For others, the question of whether they deserve sympathy or not is up for the reader to decide. One character in particular is pretty annoying (to put it mildly), but even she has taken a step forward by the end. Whether that excuses her behavior is up to you. The art is not exactly the best part of the series. If I were to describe it, I’d say “rough pencil-style”. It has quite a bit in common with the upcoming Welcome to the Ballroom, but it’s still not as strong. I actually am not a big fan of Oima’s style, but I absolutely love her imagery. 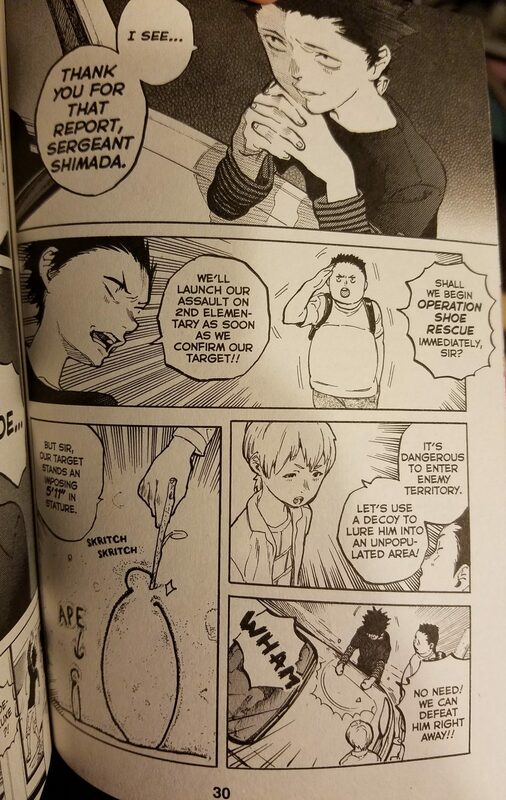 I already mentioned the Xs on people’s faces, and this provides an incredible insight into Shoya’s inner workings even moreso than any narration. Letting his guard down? X falls off. Emotional barriers up? Xs are on. We also get to see what Shoya wants to do to his younger self. Personally, I love Volume 6’s cover: a riverside underneath a bridge where everything is blurry, making it seem as if you’re looking at it from underwater; however, seeing Shoko standing in the water makes you question your senses. It’s a brilliant mirror to the story inside. The characters themselves aren’t really trendy or beautiful, and the art isn’t either. However, it’s effective at showing emotion, and that’s what matters. The Crunchyroll digital chapters and the Kodansha Comics USA collected volumes are not identical. The same person translated both versions. However, the Kodansha Comics version features some slightly altered dialogue. For instance, the teacher says, “Now I’m going to start class.” in Crunchyroll’s version, but this is change to, “Time to start class.” in the compiled volumes. An “oh” may be changed to “whoa”, etc. However, the two vary in two significant ways. Firstly, the Crunchyroll version uses honorifics; Kodansha Comics’ version does not. It’s strange that A Silent Voice wouldn’t use honorifics and yet a series like The Seven Deadly Sins keeps them in both the simul-pubs and collected volumes. (Heck, The Seven Deadly Sins hardly fixes the simul-pub errors in the volumes.) 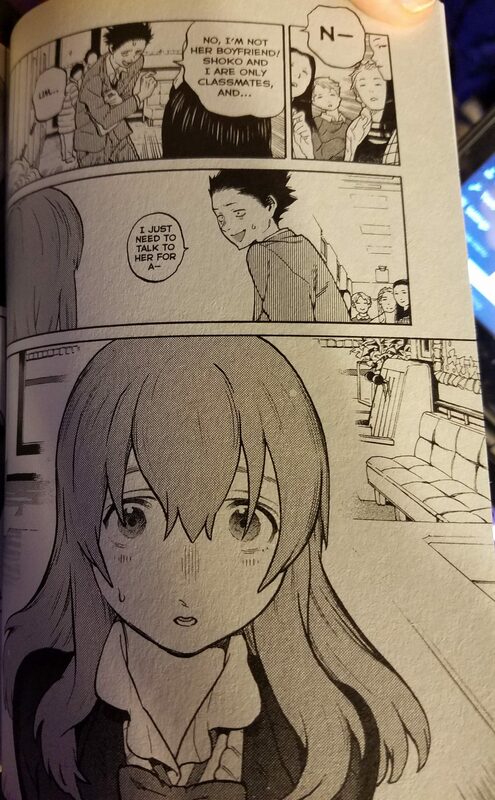 Anyways, the printed version of A Silent Voice actually goes a step further and changes almost all characters’ use of surnames to first names. I’m guessing they wanted to Americanize A Silent Voice for a wider audience. It’s one thing to drop honorifics, but I really don’t like when “Nishimiya” is changed to “Shoko”, etc. In addition, Crunchyroll’s version uses the popular Wild Words font, but the collected volumes uses an all-caps font. Quite frankly, I find it ugly and not really reader-friendly. I know some other manga use this font (some of the Tokyopop CLAMP titles off the top of my head), but I didn’t like it here. Although, it could be because I had already read it in a different font. 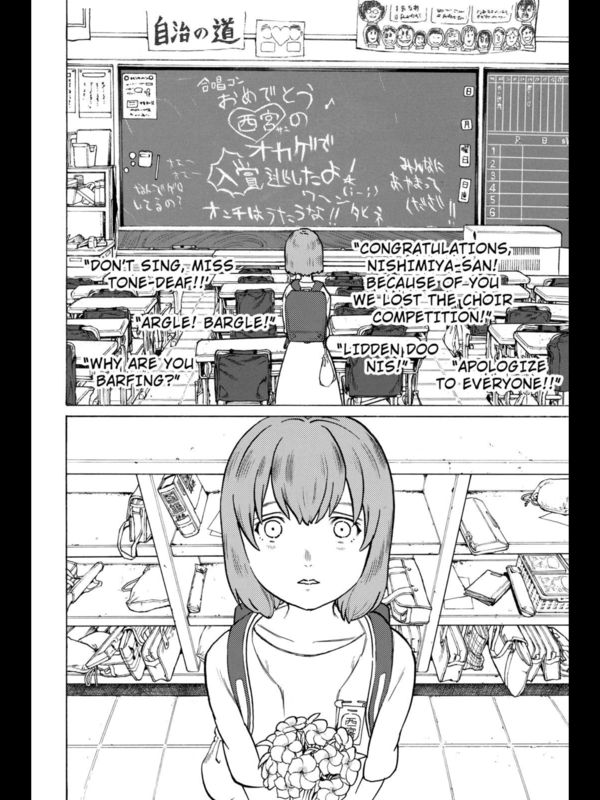 I did notice Kodansha Comics did replace text on chalkboards and stuff. Still, I’d rather have Wild Words rather than redrawn art. Crunchyroll version on left, Kodansha Comics USA on right. Click for larger images. The adaptation does a good job of translating parts like the “suki” / “tsuki” confusion, and it reads smoothly. Translation-wise, there’s parts I like better in each version. The loss of honorifics is a personal disappointment, but at least there’s color inserts for each volume. Despite its flaws, the greatest strength of A Silent Voice is that it provides quite a few avenues for discussion. It’s almost a perfect book club title. The Japanese title of this series can be translated as “the shape of a voice”, and I think it’s people who will shape A Silent Voice‘s impact. Be sure to check out this award-winning work because there’s bound to be something in here that hits a little too close to home. Whether you buy it or read it as part of a Crunchyroll Premium membership will probably rest on whether you want a more American-like experience or a Japanese one… or to make a statement that more manga like this need to be made and brought over. Oima developed the manga version of Mardock Scramble, also available from Kodansha Comics USA. An anime film is set to be released this year. The moment I saw you post this on Twitter, my first thought was “Ohhhh, boy. We got a hyped one here.” It’s nice to see you analyze the manga from both an intellectual and psychological standpoint. However, I would’ve liked to know a little more about its strengths outside of the obvious execution of the premise and more about the way the story is told. Are the flashbacks a placeholder only, or do they reappear occasionally to stir up some drama or self-conflict? Does the closing of the gap between Shoko and Shoya feel endearing by the end? What is the general tone of the story? Coming-of-age? Slice of life? Dramatic? I felt this review was a tad more vague than other ones. I wanted to try to keep it vague. It kind of just drifts like a raft instead of being a car or a train that goes from point A to point B on an established path. The Crunchryoll and Kodansha differences also made it a problem in trying to determine if this is a series to borrow or own, and so it’s more up to personal preferences. Thanks for pointing out my errors! It was disappointing to see such a wonderful series stumble at points, but hey, at least it adds more discussion points for readers! Your post has reminded me that I have yet to watch the final Mardock Scramble movie.